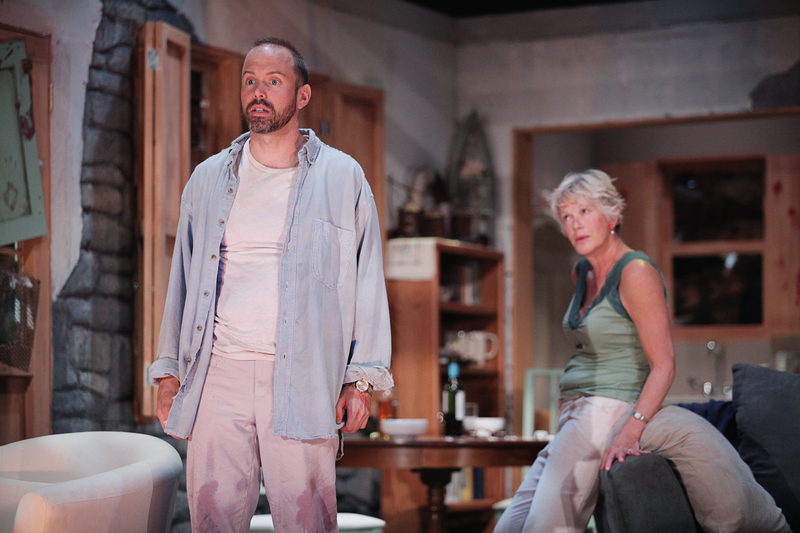 Brent Vimtrup as Nat and Sherman Fracher as Diane in Cincinnati Shakespeare Company’s 2014 production of “The Birds” by Conor McPherson from the short story by Daphne du Maurier. “The Birds” is directed by Brian Isaac Phillips and runs October 17- November 8, 2014. Performances are located at CSC’s Theatre, 719 Race Street in downtown Cincinnati. Tickets and subscriptions are available online at cincyshakes.com or by calling the box office 513.381.2273. Photo by Mikki Schaffner Photography. I am truly terrified of birds. I know its a ridiculous phobia and it doesn’t cause me any functional impairments, really, so I just live with it. But ever since I used to mow the pasture fields on the open-air antique tractors and they would dive bomb to feed off the bugs I was stirring up, coming in way-too-close proximity to my person, I’ve been traumatized. And then when I saw Alfred Hitchcock’s film on AMC when I was a young teen . . . well, it only cemented my irrational fear some more. And then good ole Cincinnati Shakespeare Company announces their season and wouldn’t you know it . . . THE BIRDS is on their docket. Great, just what I need. And at Halloween, no less! But as luck would have it there really aren’t any birds in the show; they’re just window dressing for one of the most interesting psychological thrillers I’ve ever seen produced on stage. “Diane” and “Nat” have survived the initial bird attack, some sort of apocalyptic event. They’re strangers forced together by circumstance and soon they are joined by another refugee, “Julia.” Julia is worldly, rough, and raw; very different from Diane, the novelist. Nat is an enigma, too, with some rage lurking inside. One gets the sense that Diane sees herself as their mother; at one point she says she thinks Julia might see her and Nat as parental figures but she’s wrong. And you’ll see why when you see the show. It’s taken me a few days to process the show; my immediate reaction was one of mild unsatisifaction at the show’s resolution. It wasn’t the acting. After this and OTHER DESERT CITIES, I am a huge fan of Sherman Fracher. She is so natural on stage, physically very present, and I thought her performance of “Diane” was pitch-perfect. We are fortunate to have an actor of Brent Vimtrup’s caliber working in Cincinnati. Amazingly versatile, scary, funny, powerful, and vulnerable – all the things we’ve seen him be over the last few years come out in his portrayal of “Nat.” Sara Clark is always solid and it was fun to see her play a “bad girl;” I suspect “Julia” is similar to her character in THE GREAT GATSBY had times and circumstances been different. And then there’s Nick Rose. 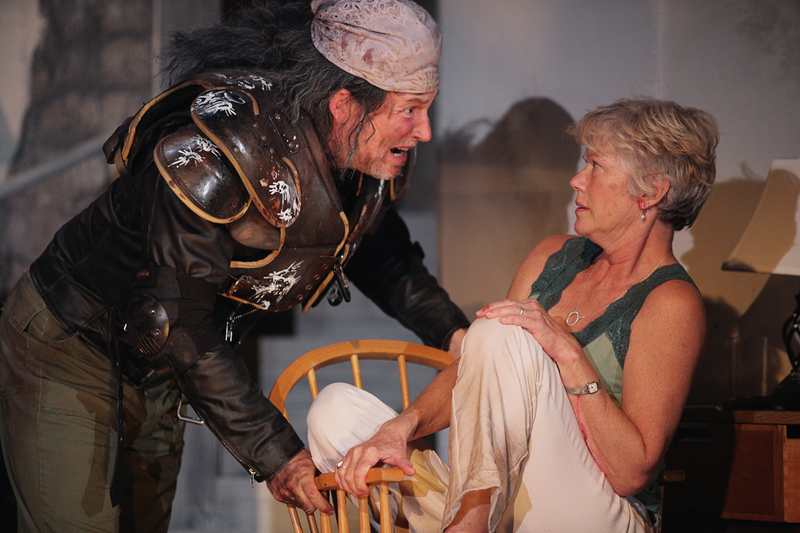 He only has one scene in the play, but he makes the most of every second he is on stage. From his hilarious entrance to his imposing posture, the physicality of the character is just the start. Every line is measured, every word a choice. I was blown away by his performance and it left me wanting more. The performances in THE BIRDS are worth seeing. So is the tech; Doug Borntrager’s sound design is vital to the success of the show and it is impressive, as usual. The set design is wonderful and the superb lighting by Anger Hungerford help us know whether its day or night and whether we’re under siege or not; never once did I lose sense of time in spite of the frequent transitions between scenes. The costumes are good, appropriate, and the makeup was realistic enough without being gross. In the hands of lesser skilled creatives, this show could be a disaster. Brian Isaac Phillips keeps the pace moving through 93 minutes of tense drama, blocking it well and using the space nicely. It is a chilling show; I felt a little anxious at times much in the same way one should when watching a thriller. So, after sleeping on it a couple of days and processing and thinking about it, I feel good about recommending the show. And frankly, any piece of art that causes this much angst is worth a look. Go see for yourself. THE BIRDS plays at Cincinnati Shakespeare Company through November 8th, with a special performance on Halloween night where costumes are encouraged. Tickets and more information can be found here.